The lost airmen of Lancaster ED559 - what happened in March 1943? What actually happened to ED559 that fateful night in March 1943 is unlikely to ever be discovered. Currently, it's not known if the crew even managed to drop their sea mines. However, there are several indicators as to what may have occurred. Given the aircraft's course and where the skipper's body was found, it's probable that they did indeed manage to drop their sea mines in the Gironde Estuary before heading for home. Other aircraft on the same operation didn't report too much enemy activity in the general area, although the Germans had searchlight and flak batteries stationed along the banks of the estuary. So, given that Lancaster ED559 had to fly under 1000ft to drop the sea mines there is a chance that they came under enemy fire which may have damaged the Lancaster severely. Another fact to consider is that after careful scrutiny of the Loss Card for ED559 there appears to have been appended at a later date some information about the collection of the skipper's body. It took me a while to fathom out that the word on the Loss Card was "Boyardville". Boyardville is a small village on the northern coast of Oleron Island (Fr. Île d'Oléron). According to a letter dated 10 June 1943 from the Casualty Branch written to Richard Curle's wife Bobbie, Fl/Lt Curle's body was retrieved from the sea on 3 April, 1943 and he was buried the following day. The letter says that he was found at St. Nicholas. I'm no expert on tides in this area but as Richard's body had been at sea for a month it may have drifted quite a distance from where he actually entered the water. Interestingly, the Casualty Branch letter notes official German information about the collection of Richard's body. The letter also includes a small picture of Richard's grave. ​In March 2018, I received a photocopy of two letters sent by the Red Cross concerning the finding of Richard Curle's body. In the year one thousand nine hundred and forty three (1943) on the third day of the month of April at fifteen hundred hours, Mr Guy NORMANDIN, the owner of the boat "MONTCALM", presented himself to the Mayor of Château d'Oléron and told us that on April 3rd, nineteen hundred and forty three, at ten thirty in the morning, when he was fishing between the buoy at Saint-Nicolas and Fort Boyard, to the south, he found in his net a body that appeared to have been in the water a long time. R.A. CURLE Off. CE 121280 R.A.F. V.R. 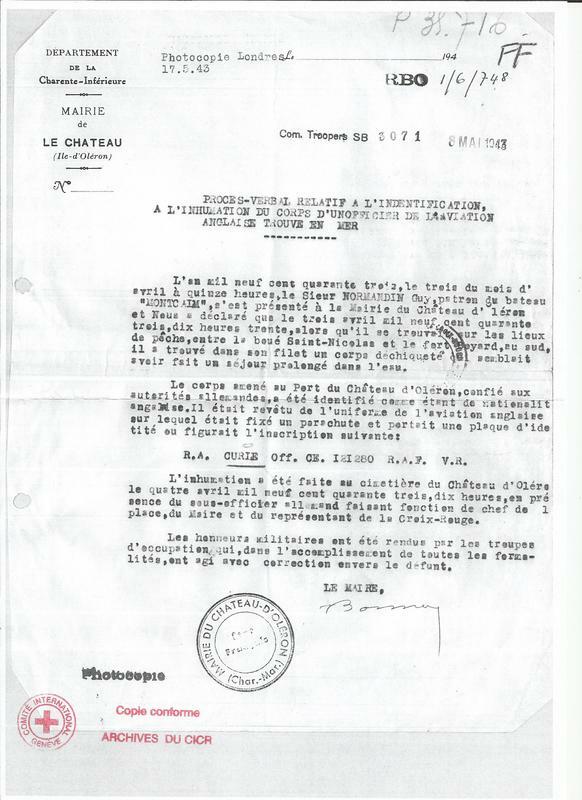 The burial took place at the Château d'Oleron cemetery on April 4, 1943 at ten o'clock in the morning, in the presence of the German deputy officer in charge of the area, the Mayor and a representative of the Red Cross. Military honours were rendered by the occupying troops, who, in the accomplishment of the duties of the formalities, acted with honour towards the deceased. Letter from the Mayor's office regarding the finding of Richard Curle's body at sea. ​What happened to Lancaster ED559 and her crew? Given the limited facts I would entertain the hypothesis that something critical affected ED559 - either from enemy fire, or perhaps some failure with the sea mines or some other technical issue. 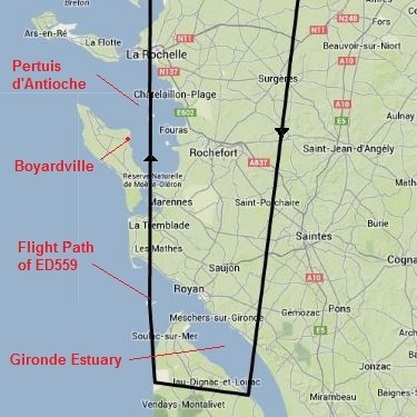 It may be surmised that the aircraft managed to turn for home but came down in an area of the sea called Pertuis d'Antioche which is a large body of water north of Orleon Island (and part of the much larger Bay of Biscay). The letter from the Mayor's office states that Richard Curle's body was found attached to a parachute. It appears from research that Lancaster pilots did not generally fly with their parachute attached. The 'chute was stored in their seat and attached to the chest harness when required. Given this is would appear that Richard had time to attach his 'chute. Accounts by other crews nearly all state a pilot would remain at the Lancaster's controls until everyone had left the aircraft. What we don't know is if the parachute was open. Whether Richard bailed out or ditched is still unknown. It is highly unlikely that the crew would attach their parachutes if ditching. No. 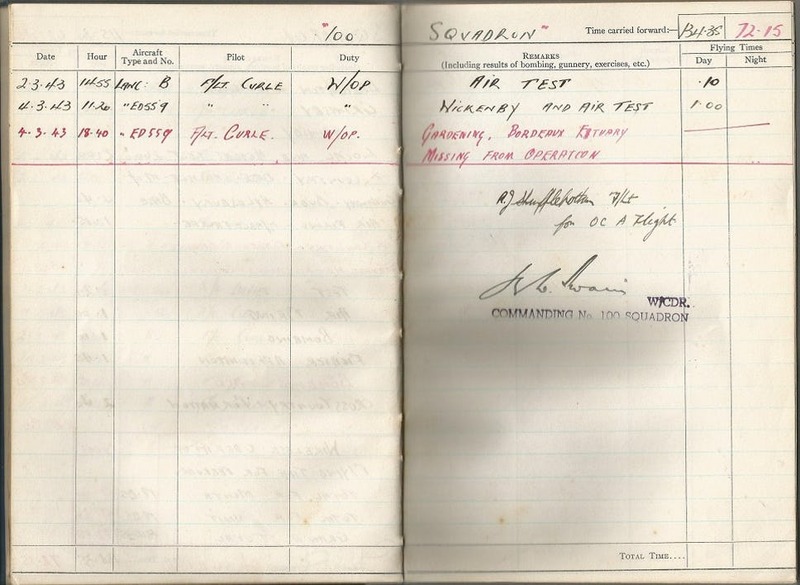 100 Squadron's Operational Record Book (ORB) detailing crews and outcome of minelaying sorties. 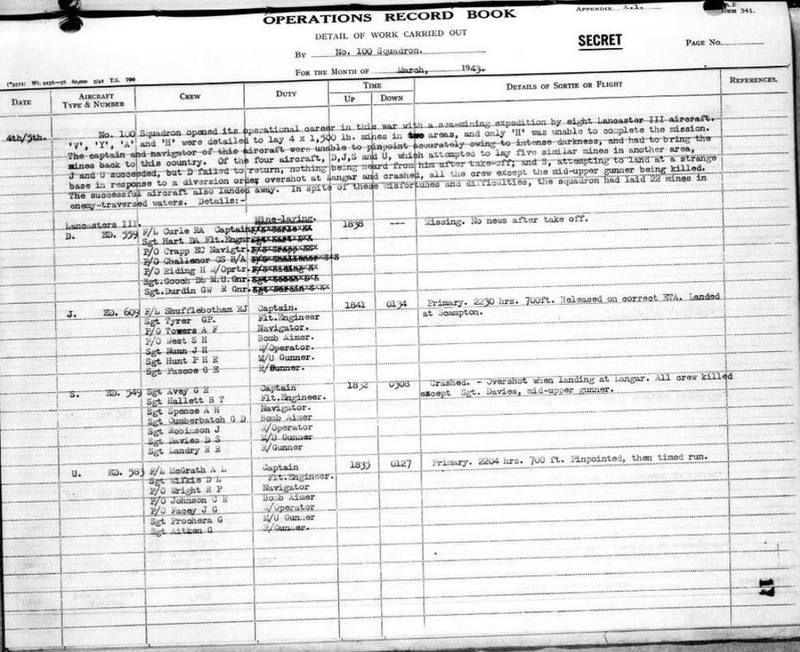 The last entry on Harry Riding's log book notes the operation's target. It has been signed by Wing Commander JGW Swain. Himself to die on operations on 20 April. 1943. 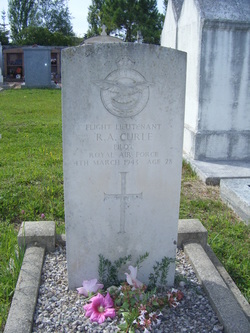 Richard Curle's body was, according to records held in Australia, recovered from the sea on 3 April, 1943 (however, the Loss Card for ED559 has 7 March 1943) and interred in the communal cemetery in Le Château-d'Oléron, the main town on the island, the following day. His was the only body recovered from ED559 - the other six crew have no known grave but are remembered at the Runnymede Memorial in Surrey. The initial wooden cross was replaced by the Commonwealth War Graves Commission.